ISBN 0802723144 (ISBN13: 9780802723147)Obtained - I read an ARC through Netgalley, but have already purchased a copy of my own. 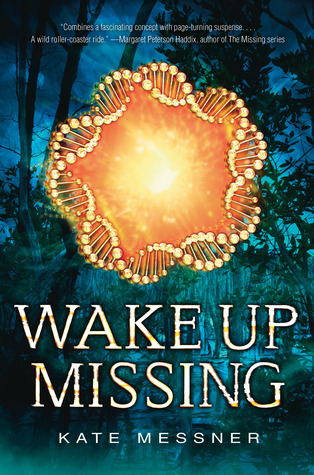 I'm including Wake Up Missing as a science fiction title, but the beauty of this book is that it really crosses many genres. This is a title that will appeal to mystery readers, those who crave action and adventure tales, and kids who love science. First, let's talk about the cover appeal. This is a gorgeous cover, and one that carries no indication of "boy" or "girl" book. I love that. I adore the contrast between the blues and greens of the swamp on the outside and the bright spot in the middle circled by strands of DNA. Awesome. As I've come to expect from the marvelous Messner, her cast of characters includes boy and girls who are equals. Each brings their own unique skills and quirks, and there are no stereotypes here. Just like in real life, it's not just boys who love sports or girls who love animals. 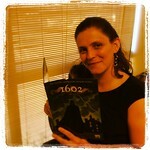 The action was intense, and I had trouble putting the book down to get other things done. I loved how the story ramped up. We start with just little hints that things are going wrong, and students will delight in putting the pieces of the puzzle together along with Cat. Unlike most science fiction, this story could be happening RIGHT NOW. How do we know what is going on in labs around the globe? Messner includes great information on the research she did for Wake Up Missing, and interested students could easily use these sources to investigate current science topics on their own. I already have a copy of Wake Up Missing heading my way. I can't wait to book talk it and get it into the hands of my readers! The early pages of Wake Up Missing provide a fabulous opportunity for close reading to look for foreshadowing (as an osprey dives for a fish). 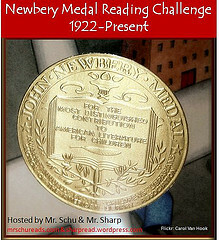 While I was able to pick that out during a first read, students may not catch it until after they finish the book. There were numerous little hints along the way that things weren't what they seemed, and readers will love discussing which ones they noticed as they read. -- What new cures are just on the horizon? -- How does each section of the brain contribute to how we function as humans? -- At what point does the ability to do something through science get outweighed by the ethics of doing it? -- How much influence does DNA have over our behavior? -- How much influence does our personal experience have over our behavior? Age Range: While it is listed as "YA", Wake Up Missing would appeal to students in fifth grade on up. There are some slightly gory parts, but nothing too extreme.